Copyright: © 2013 Y. Robert Li. This is an open-access article distributed under the terms of the Creative Commons Attribution License, which permits unrestricted use, distribution, and reproduction in any medium, provided the original author and source are credited. 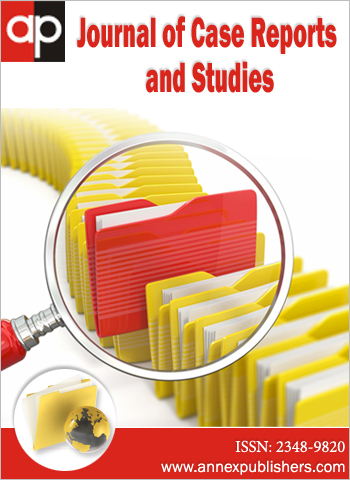 Case reports and studies may be defined as the non-experimental description of an individual or a few of cases in terms of new or unusual presentation of the diseases, an unexpected disease course or pathophysiology, and new effects (either beneficial or detrimental) of existing medications or procedures. Although they suffer from the non-experimental nature and other potential bias and errors, case reports and studies have played and will continue to play an important part in the advancement of medicine. They often serve as "primers" leading to discoveries of new diseases/disease pathophysiology as well as development of new preventive and therapeutic measures. Case reports and case studies are also employed as a platform for the training of medical students and/or resident doctors in scientific writing and critical thinking. Although the significance of case reports and studies in medicine has being recognized since the early stage of development of clinical medicine, their value needs to be appreciated in the context of modern clinical research design and the hierarchy of strength of evidence for guiding patient care. This paper discusses case reports and studies within the big picture of clinical research, research design, and evidence-based practice. Globally, practice of medicine has been increasingly becoming evidence-based. Evidence-based practice means applying the best available research results (evidence) when making decisions about health care. Health care professionals who perform evidence-based practice use research evidence along with clinical expertise and patient preferences. 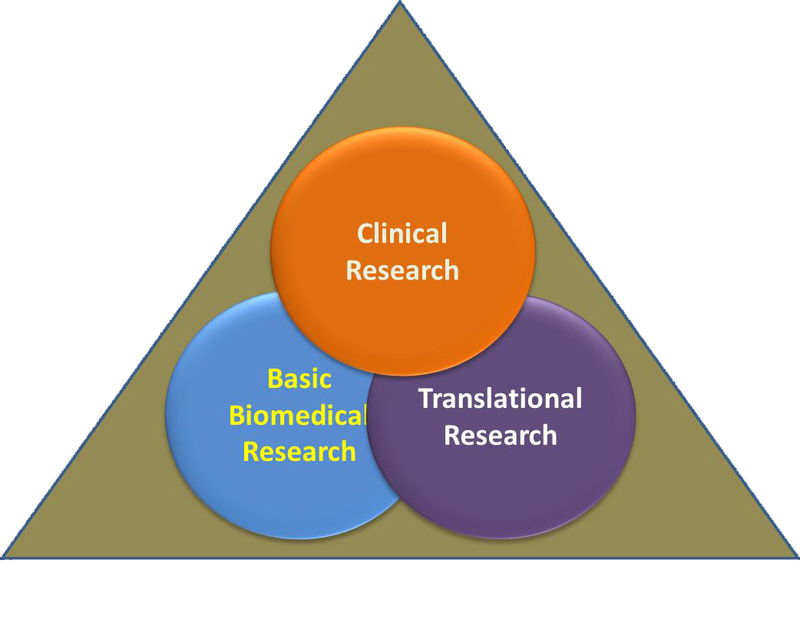 The research evidence for evidence-based practice in general stems from biomedical research especially translational and clinical research (see Figure 1 for description of the scope of biomedical research and Figure 2 for the recent United States National Institutes of Health (NIH) definition of translational research ; the NIH definition of clinical research is given in the next section). The term clinical research has been defined in various ways. In 1997, the NIH Director's Panel on Clinical Research issued a three-part definition of clinical research [2,3] (Figure 3). According to this definition, clinical research is classified into three categories: (1) patient-oriented research, defined as research conducted with human subjects (or on material of human origin such as tissues, specimens, and cognitive phenomena) for which an investigator (or colleague) directly interacts with human subjects. (Excluded from this definition are in vitro studies that utilize human tissues that cannot be linked to a living individual). Patient-orientated research may include studies of mechanisms of human diseases, therapeutic interventions, clinical trials, and development of new technologies related to diseases; (2) epidemiological and behavioral studies aimed to examine the distribution of diseases, the factors that affect health, and how people make health-related decisions; and (3) outcomes and health services research which seeks to identify the most effective and most efficient interventions, treatments, and services. Based on this broad definition of clinical research, case reports and studies may be viewed as a form of patient-orientated research. While all biomedical research provides some sort of evidence which could be potentially used to guide patient care, the quality and strength of the research evidence depend on the type of research or research design. 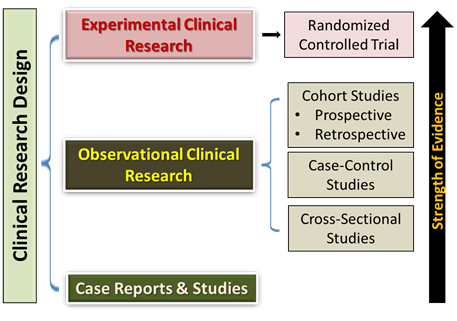 As illustrated in (Figure 4), clinical research design includes 3 types of studies: (1) case reports and studies, (2) observational clinical research, and (3) experimental clinical research . 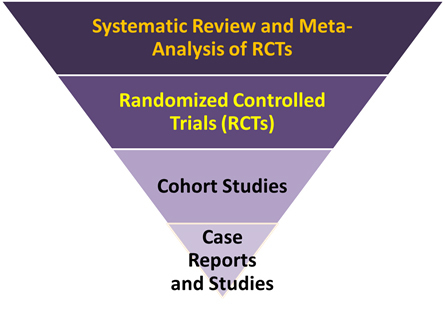 Observational research methodology includes the cohort study, case-control study, and cross-sectional study, while experimental clinical research design typically involves a Randomized Controlled Trial (RCT). If the RCT is carried out in a double blind manner, it is called double-blind randomized controlled trial. Case reports and studies can be informative in certain situations, but have limitations due to the low strength of evidence that they provide. Indeed, in evidence-based disease management guidelines from many professional organizations, such as the American Heart Association and the European Society of Cardiology, evidence provided by case reports and studies falls in the level C of the evidence categories (A, B, C) [5,6] (Figure 5). The low strength of evidence provided by case reports and studies results from multiple intrinsic characteristics of such studies, including (1) lack of appropriate controls; (2) limited sample size (one to a few individuals); and (3) lack of blinding. All these intrinsic characteristics bring about significant bias and random errors. Because of the above limitations, interpretation of the results of case reports and studies and discussion of their implications must be done with great caution. 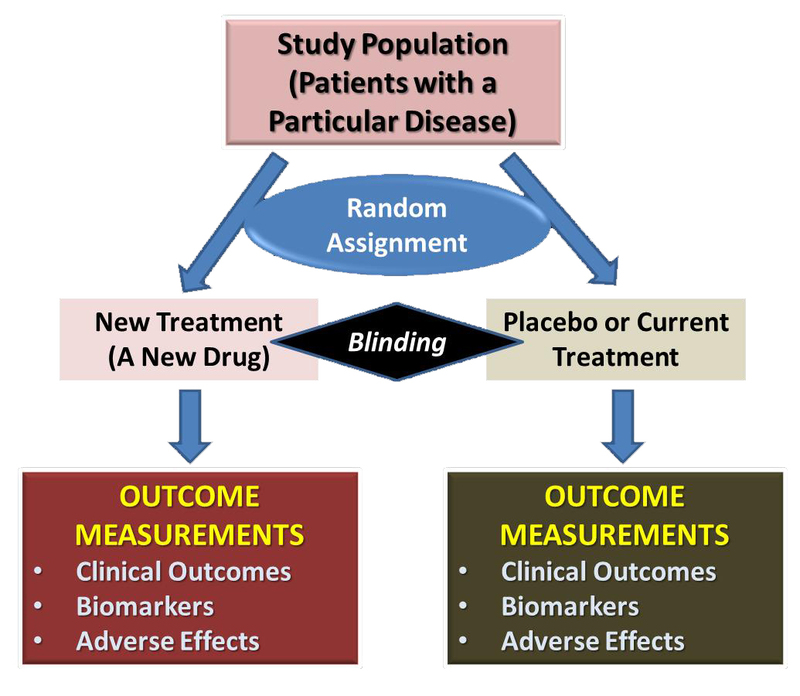 In contrast, in the hierarchy of evidence provided by the above three categories of clinical research design, the double-blind randomized, placebo-controlled trial (overall design shown in Figure 6) provides the strongest evidence for the safety and efficacy of a preventive or therapeutic modality . The strength of evidence is further increased by systematic review and meta- analysis of multiple randomized controlled trials (Figure 7). The strength and quality of the clinical research evidence determine the effectiveness and quality of evidence-based medical practice. In this context, recommendations in disease management guidelines from professional organizations are based on the best evidence currently available. In this context, randomized controlled trials, and their systematic review and meta- analysis are most frequently cited as the strongest evidence for disease management recommendations. In the absence of other studies, case reports and studies are also cited to provide information for health care providers. The usefulness of such information should be judged in the context of case reports and studies, and the value in guiding patient care must not be overstated. Regardless of the limited value of case reports and studies in proving direct evidence for medical practice, they, as also mentioned earlier, may serve as "primers" to lead to new discoveries that subsequently impact evidence-based practice. In this regard, the value of case reports and studies lies in their role of providing clues to new medical discoveries and the subsequent development of preventive and therapeutic measures to control human diseases, rather than directly providing first-line of evidence to guide medical practice (Figure 8). 1 NCATS (2013) Institutional Clinical and Translational Science Award (U54). 2 NIH (2013) Clinical research. 3 NIH Executive Summary: NIH Director's Panel on Clinical Research Report 12/97. 4 Li YR, Mahalik MP, Kauffman JF Jr. (2013) Biomedical Research: strategic planning for success. Nova Science Publishers, New York, USA. 5 Yancy CW, Jessup M, Bozkurt B, Butler J, Casey DE, et al. (2013) 2013 ACCF/AHA Guideline for the Management of Heart Failure: A Report of the American College of Cardiology Foundation/American Heart Association Task Force on Practice Guidelines. J Am Coll Cardiol (In Press) 15: e147-239. 6 The Task Force on the management of ST-segment elevation acute myocardial infarction of the European Society of Cardiology (ESC), Gabriel S, Stephen KJ, Dan A, Luigi PB, Carina BL, Borger MA, et al. (2012) ESC Guidelines for the management of acute myocardial infarction in patients presenting with ST-segment elevation. Eur Heart J 33: 2569-619. Figure 1: The scope of biomedical research. Biomedical research is a vast field of science that includes parts of life, physical, and social sciences. Biomedical research comprises three intertwined components, i.e., basic biomedical research, translational research, and clinical research. Alternatively, biomedical research has been classified into two broad areas: biomedical research not involving human subjects, and biomedical research involving human subjects. Figure 2: The NIH Definition of translational research. Translational research has been a buzzword for many years now, and a Medline search indicated that the term translational research appeared as early as 1993. Translational research has been defined in various ways by different organizations. For example, in an early announcement about applying for Clinical and Translational Science Award (CTSA) before the establishment of the new National Center for Advancing Translational Sciences (NCATS), the NIH offered the following definition for translational research: "Translational research includes two areas of translation. One is the process of applying discoveries generated during research in the laboratory, and in preclinical studies to the development of trials and studies in humans. The second area of translation concerns research aimed at enhancing the adoption of best practices in the community. Cost-effectiveness of prevention and treatment strategies is also an important part of translational science". In a more recent program announcement of the Institutional Clinical and Translational Science Award (U54), the newly established NCATS, a signature project of NIH director Francis S. Collins, defines translational research broadly to include the early steps necessary to develop new therapeutics, devices and diagnostics from basic discoveries, the steps necessary to establish real world efficacy, and the research needed to improve the practical implementation and dissemination of improved approaches to care. This breadth is sometimes described as T1 through T4, as illustrated in the figure. The NCATS definition of translational research is becoming widely accepted as the most comprehensive description of translational research. This definition of translational research makes the distinction between translational research and clinical research less obvious. Indeed, as depicted in Figure 1, the three components of biomedical research are intimately intertwined with significant overlaps. 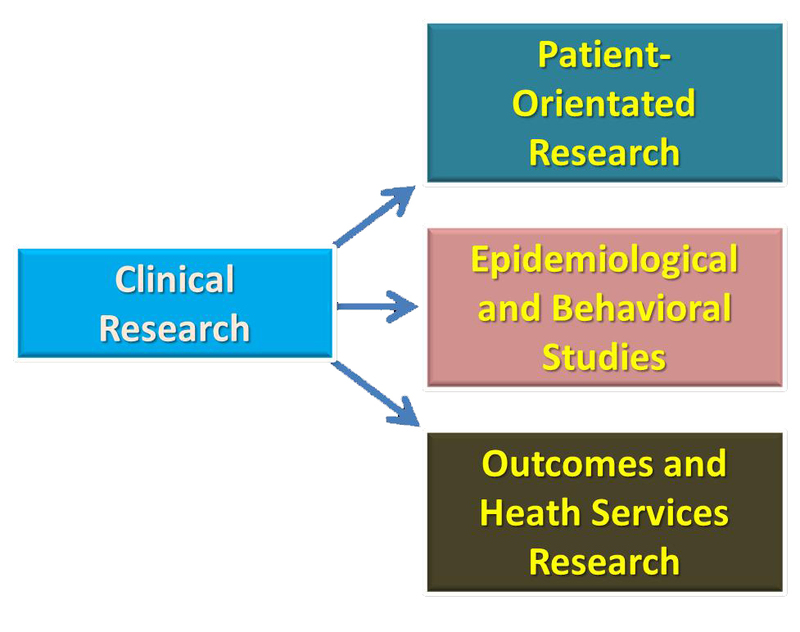 Figure 3: The NIH 3-part definition of clinical research. The NIH's 3-part definition of clinical research has been widely accepted by institutions and programs and provides a common basis for the NIH-funded clinical research training programs. The definition has facilitated cross-program efforts to identify core competencies, best practices, and meaningful outcomes that are relevant across the broad spectrum of medical research and patient care. Today, about 30% of the NIH budget is spent on clinical research. To facilitate clinical trials, a major type of clinical research, the NIH also provides a registry and results database of publicly and privately supported clinical studies of human participants conducted around the world. This database is known as ClinicalTrials.gov (www.clinicaltrials.gov) ClinicalTrials.gov currently lists 147090 studies with locations in all 50 states of the United States and in 184 countries. Figure 4: Clinical research design modalities and the strength of evidence they provide. A cohort study is a type of observational study in which the investigators select a group of exposed individuals and a group of non-exposed individuals and then follow up both groups to compare the incidence of disease in the context of exposure to specific factors or preventive/therapeutic measure. A case-control study is also a type of observational study that compares two groups of people: those with the disease or condition under study (cases) and a very similar group of people who do not have the disease or condition (controls). Investigators study the medical and lifestyle histories of the people in each group to learn what factors may be associated with the disease or condition. For example, one group may have been exposed to a particular substance that the other was not. A cross sectional study measures the prevalence of health outcomes or determinants of health, or both, in a population at a point in time or over a short period. Figure 5: Levels of evidence used in disease management guidelines from professional organizations, such as the American Heart Association. 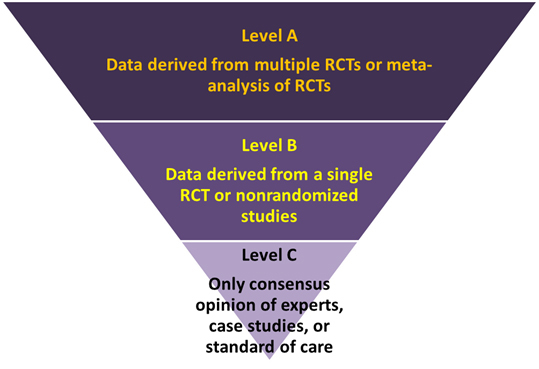 As depicted, evidence provided by case reports and studies falls into the level C category, which is considered as the weakest evidence for evidence-based practice. Figure 6: Basic design of a double-blind, randomized, placebo-controlled trial. A placebo is a substance or other kind of treatment that looks just like a regular treatment or medicine, but it's not. It's actually an inactive "look-alike" treatment or substance. The person getting a placebo does not know for sure that the treatment is not real. Sometimes the placebo is in the form of a "sugar pill," but a placebo can also be an injection, a liquid, or even a procedure. Even though they do not act on the disease, placebos seem to affect how people feel (this happens in up to 1 out of 3 patients). A change in a person's symptoms as a result of getting a placebo is called the placebo effect. Whenever possible, the investigators should design the trial in such a way that the study participants, study staff who have contact with them, persons making laboratory measurements, and those adjudicating outcomes have no knowledge of the study group assignment. When it is not possible to blind all of these individuals, it is highly desirable to blind as many as possible and always blind laboratory personnel. Blinding includes single- and double-blind masking. Single-blind masking is a type of masking in which one party involved with the clinical trial, either the investigators or participants, does not know which participants have been assigned which interventions. Double-blind masking is a type of masking in which two or more parties involved with the clinical trial do not know which participants have been assigned with which interventions. Typically, this includes the investigators and participants. On the other hand, the term open-label study describes a clinical trial in which masking is not used. This means that all parties involved with the trial know which participants have been assigned with which interventions. Among the various forms of randomized trials, double-blind, randomized, placebo-controlled trials provide the strongest evidence regarding the efficacy of a preventive or therapeutic measure. Figure 7: The hierarchy of strength of evidence for preventive and therapeutic measures. In the assessment of the effectiveness of a preventive or therapeutic measure, systematic reviews and meta-analysis of randomized controlled trials (RCTs) provide the strongest evidence for evidence-based practice. Here the term systematic review refers to a summary of the clinical literature in a comprehensive manner. It is a critical assessment and evaluation of all available clinical studies that address a particular clinical issue. The term meta-analysis is defined as a way of combining data from many different research studies. A meta-analysis is a statistical process that combines the findings from individual studies. 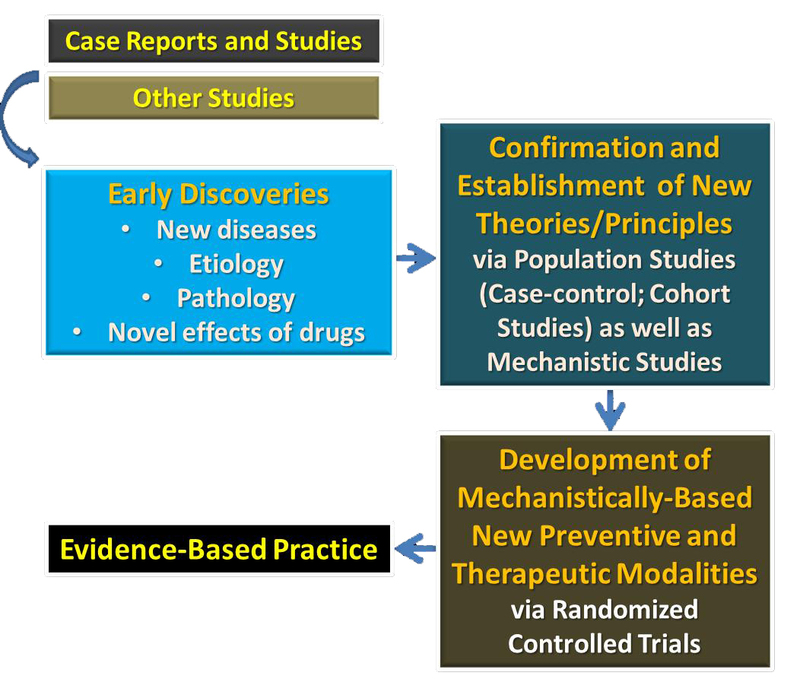 Figure 8: Role of case reports and studies in medical discoveries and development of preventive and therapeutic measures for evidence-based practice. As illustrated, the true value of case reports and studies lies in their contribution to new medical discoveries, such as a new disease or disease pathology, a new cause or risk factor for an existing disease, and novel effects of pharmacological agents or other therapeutic modalities. Although they provide clues to new medical discoveries that may eventually mature to a stage that benefits patient care, case reports and studies generally do not directly impact evidence-based practice due to the limited strength of evidence they provide.